Will you still love me when tomorrow comes!!!! Disclaimer: Beauty is only skin deep and very fleeting…when looking for someone to spend time with make sure they are everything you are looking for on the inside as well as on the outside.. Only God’s love is true love and it is never shallow but enduring until the very last breath is taken and beyond!. You don’t always have to be out front to be the leader. Sometimes you have to lead from behind. The objective is to effective. Being in the leader position is not always effective. Yes, you may have the vision but it takes followers to bring the vision to life. Without active followers the vision remains in the abstract and is never brought into concrete form. When people are intimidated by you for whatever reason they may feel inadequate. These insecurities often result in inertia. Not doing anything for fear that it won’t come out just right. Or it won’t be as good as the next person. It can also result in individuals just allowing the smarter one, the leader to do everything. Because they feel like they (the leader) have more knowledge than they do. When this happens. Nobody grows. No one develops. 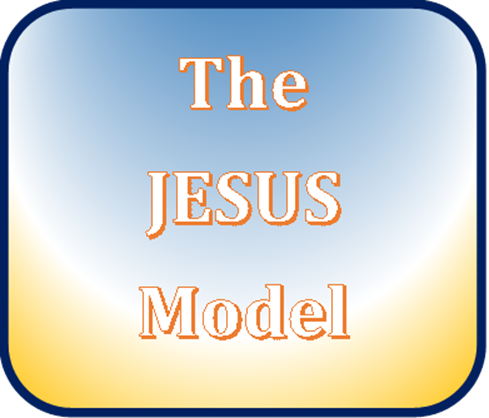 The Jesus model emphasizes servant leadership. Becoming equal to demonstrate greatness. Pulling off your titles, crown and royal robes and taking on equal sometimes even inferior status to demonstrate the greatness in others. Jesus, the perfect model for servant leadership came from a holy, immaculate, exquisite home to be born in a dirty, stinky stable alongside animals and hay. Why, would he do that? His actions were so that we could be redeemed. The creator of the universe became man so that man could become one with the creator. In the Old Testament he led as God. There was very little kinship and camaraderie with the people. God being so holy could only relate to those he had called and anointed for the task. It was difficult to build a relationship with a God of judgment. He was one to be feared not one to talk to as your friend. Only a few special people had that privilege. In the New Testament, with titles taken off, all of that changed. Now everyone had the privilege of speaking to him as a friend and confidant as their personal redeemer. No longer was he unapproachable. No longer did you have to be intimated by his presence. Upon his leaving this earth he declared that all of the power that he had was now given unto us. We now could do the same things that he did while on earth. While in the Old Testament there were only had a few people he could commune with, in the New Testament and subsequent ages millions of people are able to communicate with him on a personal level. Millions of people are now able to carry out his work and do the good that he foresaw. What a great way to be effective. What a great way to get the job done. So, here on earth in order to be effective sometimes we have to take off of the titles and big robes and degreed statuses to help others understand their greatness. When you know who you are. When you have come to a certain place of maturity you no longer need titles to do the work you are called to do. If the objective is to help others achieve their greatness sometimes you have to become as others to help them see all that they are capable of being and becoming. As long as you are out front they are always looking to you and they can never truly see themselves. Now, stepping back is going to be hard. Especially when people are used to you stepping forward. It will not only be hard for them it will be hard for you. The innate qualities of a born leader are constantly on automatic. Leaders find themselves being creative, coming up with ideas, solving problems and the whole gamut. But if you are not careful you will find yourself alone in these endeavors. Your leadership persona is too much. It’s overpowering. And people can feel overwhelmed by your presence and your actions; thus leading to follower’s inertia. Empowering others requires patience and a stillness in one’s spirit. You will often be misunderstood. Some will think you have abandoned them. They will feel like you are letting them down. They will feel all sorts of emotions. But at the end of the day those with leadership potential will step forward and you can gently guide from behind. Let me the first to tell you it will hurt for your actions to be misunderstood, but you have to remain true to the greater purpose. If the greater purpose is to empower then remain true the calling. Many didn't understand why Jesus had to die. They didn't understand why he had to leave them. Here was God in the flesh allowing man to crucify him. Unspeakable! Unheard of! Why? The answer is simple. He did all of that so that you and I can be empowered today. So that you and I can do greater than he did. As a leader, the objective is to be effective. To show others their greatness. To empower the weak and stand beside the strong. Others will never see their greatness as long as they are walking in your shadow. Stand aside and allow their light to shine. Great leaders are flexible, adaptable and effective. The next time you find yourself in a situations that seems hopeless, try using the Jesus Model. It worked for the creator of the universe. It will work for you. Embrace your greatness and help others embrace theirs. While my faith dictates that I fear nothing and no one. 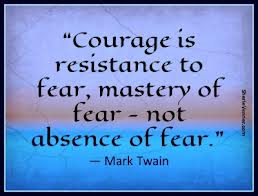 For we understand that God has not given us the spirit of fear but of power. On a higher consciousness level my greatest fear is not living on purpose. My greatest fear is complacency, contentment with mediocrity. Being okay with living a subpar life. Feeling sorry for myself because of perceived or real disadvantages. Taking upon myself the burden of a history of an enslaved people but not taking upon myself the history of a kingly, blessed and mighty people. My greatest fear in living in a projected bubble that was spoken upon me by another. I fear dying without ever having lived. But my great fear is the fear of not being the ME I was created to be. And so I have learned not to fear, but to stand in my courage. In the essence of me, my created being. My tagline, mission, slogan, and brand of sorts is Embrace Your Greatness. I use it in hashtags on twitter, Facebook and Instagram. It’s my message to people everywhere but especially the lost, wounded, hurt, heartbroken, and in particularly young women. 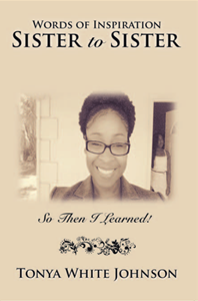 It is expressed on the back cover of my book Words of Inspiration, Sister to Sister: So Then I Learned. And while you can probably find those words anywhere. Just do a quick google search and it will come up in many places. 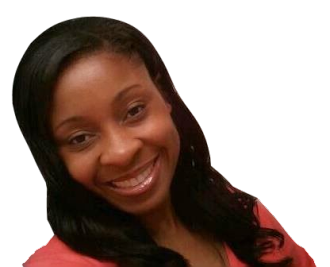 And, you probably think you know what I mean with those words, I want to clarify my thought process behind my positive affirmation for you to Embrace Your Greatness. You see before I started using it I had no idea it was such a used phrase. My usage of the phrase comes from two thought processes. One, as a professor, having taught many students I see too often how low self-worth and low confidence stunts the growth of our young people. Somewhere in their background, typically, their childhood they were told, you can’t, you are not capable, you are not the right color, or the right size or the right…and the list goes on and on. They are hardly ever told that they are good enough just as they are. This low self-worth manifest in their grades and behavior. They act out because they are seeking attention. They do poorly in school because they feel like what’s the use anyway and so the cycle of impoverished thinking continues. Looking through his eyes of love and compassion for the human soul there is greatness in every soul that breathes. There is ability and capability. There is creativity and creative powers. There is powerful and prolific thought processes that can result in brilliant writers, authors, doctors, surgeons, pianist, musicians, athletes, activist, actors, humanitarians, entrepreneurs and so much more if someone took the time to look beyond the external and see the greatness that abides inside of us all. Secondly, when we embrace our greatness we can clearly see greatness in others. For those of us that believe in Jesus Christ as our Lord, the scriptures says Greater is he that is in us than he that is in the world (1John 4:4). In this battle between good and evil. Greater came to overcome evil. And he showed himself mighty as he died a horrible death on the cross and rose again on the third day claiming victory over death and the grave. That Greater power left this physical world but not without leaving a gift behind. He promised to give his spirit to anyone that would accept it. If you are a believer then you have accepted the gift of his spirit and so in you and I resides the same power that he had. He is limitless and so are we. So when I say embrace your greatness to believers. I am asking you to embrace the Holy Spirit that lives inside of you. Know that there’s nothing you can’t accomplish. Know that all things are possible for you. Know that you have the greatest power that ever existed living inside of you. When this power is acknowledged there is nothing that can stop you from being the best you that you can possibly be. You and I will reach our destiny as long as we embrace our greatness!! Allowing the gift of the Holy Spirit to reign in our lives through the reading of his letters to us (the bible) you will begin to see others through his loving eyes and heart of compassion. When we all look with those eyes and hearts we understand we are all united in one mission, to love each other as He loves each of us. This brings about a clarity that allows us to see clearly the greatness that’s in us all. Embrace your greatness and inspire someone today. The question of validation is a relevant question. Maturity teaches us a lot about validation and being secure in one’s own worth. I am a firm believer of when you learn, teach. These days I am much more secure in my own skin that I was, even 10 years ago. But this security, this wisdom came at a price and through experience. I remember very clearly being young and insecure in my being, in my essence. Unsure of myself in many ways. Granted, in some ways I was over the top secure. People who knew me back in the day would say, but you were always confident. And yes, professionally, I was confident in my abilities and there was no stopping me. But personally and emotionally I was a mess. I was broken and heartbroken. Searching for love in all the wrong places. Even today I recognize it when I see it. So, I understand very clearly the purpose of my “going through” was so that I can relate to the signs and symptoms when I see them today. And truthfully, I am good with that. I am better than good, I am grateful! My stories provide inspiration for my sharing. 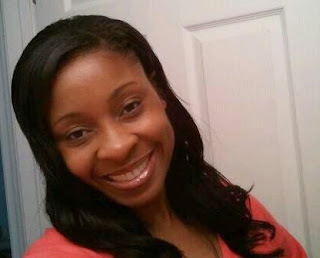 My stories have encouraged many young women on their journey and for that I am grateful. And so if I had to do it all over again. I would. But, my heart aches and reaches out to those who are still in the grips and vices of needing others validation. Today, I see relationships being slaughtered because of the emotional shattering that needing and wanting validation from others can cause. I see young women giving up and never reaching their full potential because of their inability to see and embrace their greatness. What we don’t understand is just how much our present is affected by our past. Years ago someone that I cared about deeply told me very clearly that it was not his job to validate me. For the first time I really heard that statement and although it hurt I took it as it was meant. Simply the truth! Humans have a need to be validated by others. It starts from an early age. We want our parents to be pleased with us. We look up to grandparents, preachers, friends, teachers. Little girls need their dad’s approval and love. Little boys are just as needy if not more. Most of our lives are spent trying to please someone and so when it comes to relationships we look to them for validation and; unfortunately, some people are just not up to the task. But, we have to ask ourselves, should they be? Should others validate us? I think in loving relationships we nurture each other and feed each other with love and spiritual healing, but its shouldn’t be anyone’s responsibility to validate us. 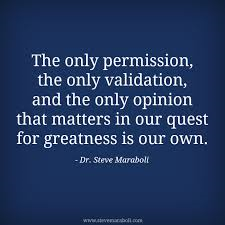 When we talk about validation we speak in terms of others substantiating our being. Others being the reason we live. Needing others endorsement to feel okay with our essence. There is only one person that can substantiate your being and that is you. God already put his brand of approval and called his creation good. So who else do you need to say that you are good? 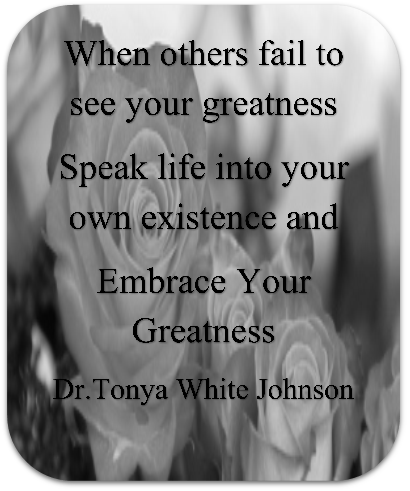 I encourage you today to embrace your greatness. Embrace the very essence of who you were created to be. Stand in the mirror and smile at him/her and declare your victory. 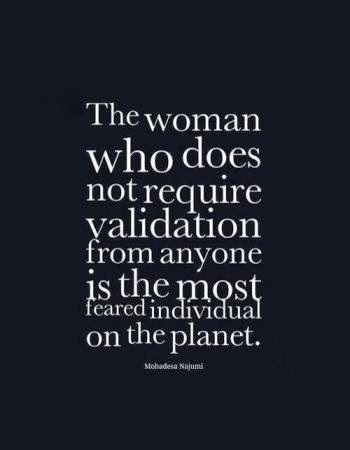 You are all the validation you need. Your brand of approval is all that truly matters. You came into this world alone and you will leave alone. Your character will be the legacy left behind. Take back your power and know that you are amazing just as you are. That is all the validation you need. Give someone the gift of Empowerment. ©2014 Tonya White Johnson. Simple theme. Powered by Blogger.